Set up a pitcher of iced-tea on top of the Amish Cedar Wood Round Table and enjoy an afternoon in the pool, an outdoor lunch or a visit with a friend. Quality outdoor furniture is essential for enjoying your time outside. A wooden outdoor table like this one invites everyone round to enjoy the fun. This outdoor table brings with it many benefits including durability, functionality and an eco-friendly nature! Handcrafted for your home with hearty cedar wood, this outdoor wood table naturally resists decay and its fresh cedar scent repels bugs! In addition, the wood is thermally modified, meaning it goes through a process of heating, steaming, and kiln-drying to enhance its strength and durability. The aromatic red cedar wood used is grown and harvested in the U.S. and is sealed with Pure Wood Sealer that contains no chemicals whatsoever. 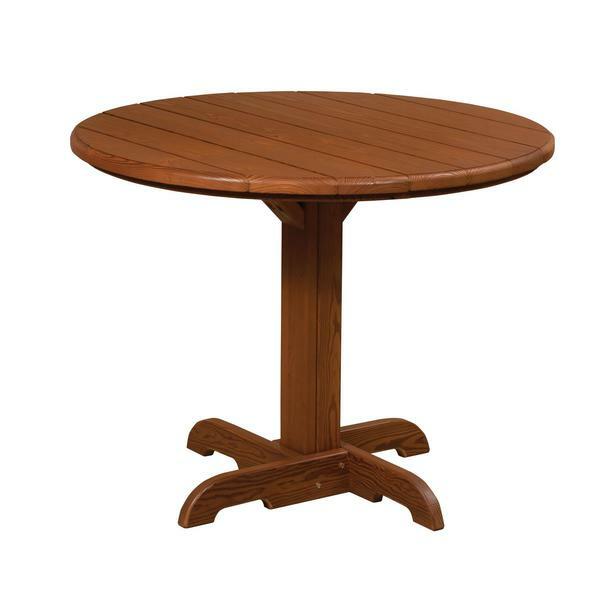 Enjoy outdoor furniture that supports a green household with this Cedar Wood Round Table. What are the benefits of wood outdoor furniture versus poly lumber furniture? Find out in our blog post, Wood vs. Poly Outdoor Furniture: Help for Deciding. A staple for your outdoor furniture collection, this Amish made Cedar Wood Round Table is ready to host family fun as it serves up plenty of smiles. If you prefer a complete outdoor wood dining set, see our Amish Cedar Wood Round Table and Chair Set available at a very attractive price.